A few weeks ago, Thales (a multi-national company that designs and builds electrical systems) came to the University of York. With them, they brought a competition centered around the Arduino; a microcontroller platform popular amongst hobbyists and professionals alike, and a platform I have used a little before. Those that had been selected for the competition (via an application process) all met for an evening workshop on the 27th February, which gave us the chance to learn both about the company and the Arduino. By the end of this workshop, all competitors had a solid grounding in how to program and apply an Arduino Uno. Then, the real competition began, and we were told to form teams of 3-4 people.We were then told what our task was: to use the Arduino in conjunction with any hardware we wanted in order to created a product/system that would fit into one of Thales business areas, that is Aerospace, Space, Defence, Transport and Security. I teamed up with two of my fellow coursemates, and we got down to brainstorming. 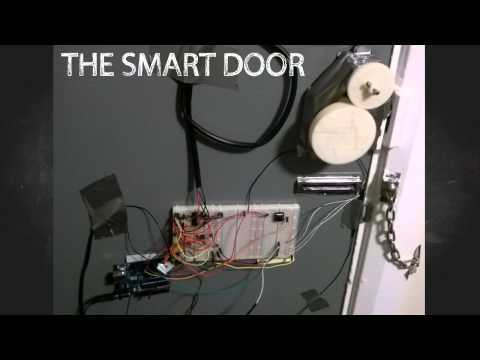 Quite a few ideas were thrown around, but in the end we settled on a system that would bolt on to the back of a university room door, and manipulate the lock so that it could be controlled by means other than the key. In our case, a fingerprint sensor. This would involve quite a lot of work, including the mechanism to physically control the door, the electronics to facilitate this, as well as the program to manage all of this.Furthermore, our idea would not be judged in a live demo, but instead via a video that we had to film and edit. To add to that, we had exactly 3 weeks (starting from the end of the workshop) in order to complete this. We set to work at once. Needless to say, things got quite tight. The parts needed for the mechanism (a couple of gears that attached to the door lock) were designed and printed out using a 3D printer. The electronics soon followed suite, consisting of a motor and driver, the fingerprint sensor, a reed switch, a push button switch, and of course the Arduino itself. The final functional part was the program itself, and so that half way through the 2nd week, we had a working project. Now came (arguably) the trickiest part. We had a week to film and edit the video, which is key to progressing in the competition, since it is likely to be the only part of the project people outside the team will actaully see and judge it by. This was especially difficult because the end of the second week marked the end of our term, meaning everyone had already made plans for the holiday, and the team would not be together. This left little choice. We managed to fit all the filming into two days before we split up. Once I got home, editing began, and finished on the night of the submission deadline. The result? You can see our entry below, as well as other entrants by searching "Thales Arduino 2014" on Youtube. At the time of writing, the competition is still ongoing. The videos made by York students are to be assessed by Thales judges in the first (local) round, in which one of the teams will be selected as the York winner. The winner from the local round could then go on to the national round, in which the top three videos from the six universities competing will be put to a public vote to determine the winner. Update - Unfortunately, we didn't go through to the next round. However, the video is still going strong on Youtube!